Swisher’s plat noted that it was an addition to “South Austin” rather than Austin, perhaps acknowledging South Austin’s separate identity from the capital city. Swisher allotted a very generous 120 foot right-of- way through the center of his grid-style residential addition. The wide avenue was laid out in a direct line with Congress Avenue on the north side of the river. This visionary and civic act dedicated a grand view from Swisher’s farm to the public domain. 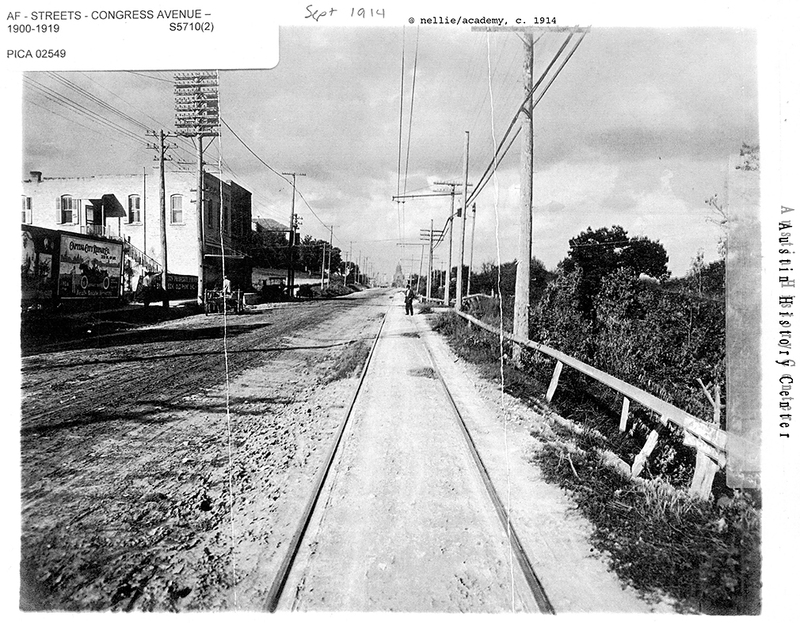 South Congress Avenue, in spite of being separated from the downtown portion of the street by about a mile over the Colorado River and low-lying areas, preserved the major approach to the city center and the capitol for future residents and visitors. A permanent and fully paved connection from Bouldin Creek to the north side of the river would not be complete for another 50 years. Swisher named the other streets in the addition after members of his family and neighbors: Milton, Monroe, James, Annie, Nellie, Elizabeth, Mary, Johanna, Eva, Newton and Brackenridge (South Austin Advocate 1939: 12). These names have survived to the present. Though the Swisher Addition, with its streets named for various Swishers (Monroe, Mary, Johanna, Eva, et cetera), and similar projects around it were never intended to be grand, downtown hopes for South Austin’s fortunes were so high that many parcels were snapped up as investments by wealthy Austin families.